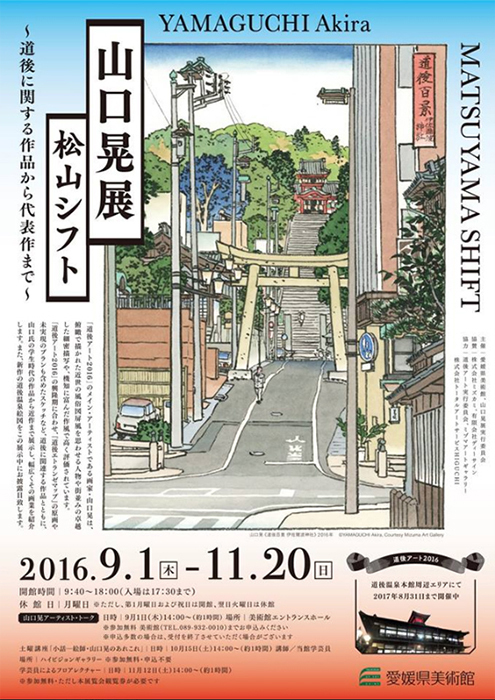 YAMAGUCHI Akira’s solo exhibition ‘Matsuyama Shift’ at the Museum of Art, Ehime, opens on Thursday 1st September. The exhibition will include both new works relating to Dogo Onsen in conjunction with Yamaguchi’s ongoing work as the main artist of Dogo Art 2016, as well as original works created for his ‘Dogo L’É鉛ranger Map’. Please note that the talk event will be held in Japanese. For further details and to register, please see the link below.